A Weld-It-Yourself Duramax SAS Kit. This is the DELTA VS version of the kit originally designed by Tim at Custom Auto Solutions. After the project was open sourced we modified them for CNC bending for a perfect fit just like Tim designed. Ships freight, get ahold of us before ordering for an accurate quote, past kits have shipped between $150 and $350. 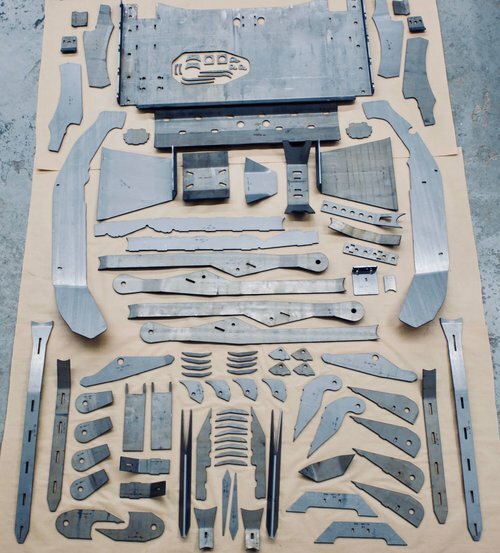 The kit comes with all the sheetmetal pieces from "Tim's SAS Kit" pdf. They are laser cut from pickle and oiled steel and are CNC formed for an exact fit. Also included is enough 1.5X0.188 DOM steel tube needed for both upper adjustment links. The fabricator is responsible for cutting to length and coping the ends to fit the poly performance flex joint.